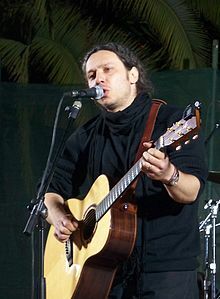 Alkinoos Ioannidis (Greek: Αλκίνοος Ιωαννίδης; born September 19, 1969) is a Greek-Cypriot composer, lyricist, singer, and orchestrator. He was born in Nicosia on 19 September 1969. His artistic family, with a painter father and poet brother was a source of inspiration for him. He first wanted to study drums, but couldn’t due to the lack of a drum teacher in Nicosia. Instead, he studied guitar. For the first 20 years of his life, he lived in a Nicosia suburb. After his military service, he went off to Greece to study theatre. He also entered the School of Philosophy, University of Athens, which he later gave up. He was more successful in his theatre studies where he played some major roles in well known Greek tragedies such as Alcestis. At the age of 23 he recorded his first album called Stin Agora Tou Kosmou (Greek: Στην Αγορά Του Κόσμου, In The World’s Market) with lyrics and music written by Nikos Zoudiaris. This demo tape eventually reached the hands of a well known singer, Dimitra Galani. She instantly became fond of their music and Alkinoos’ voice and helped them get a record deal. Alkinoos and Zoudiaris followed with another album called Opos Mistika Kai Isicha (Greek: Οπως Μυστικά Και Ήσυχα, As Secretly and Quietly). Both albums turned gold. From 1993 to 1997 he toured frequently in support of other artists, including one of the most important female figures of Greek music, Eleftheria Arvanitaki. He also carried out one solo tour. Ioannidis rarely appears to give interviews or take part in television shows. His primary public appearance consists of concert tours that he gives every year in locations around Greece and Cyprus. In 1997 his first self-penned album, O Dromos, O Hronos Kai O Ponos (Greek: Ο Δρόμος Ο Χρόνος Και Ο Πόνος, The Road, The Time and The Pain), was released to critical praise. The cover to was painted by his father. His subsequent albums have also had their covers painted by his father. In 1999 he released another self-penned album, Anemodiktis (Greek: Ανεμοδείκτης, Weather Vane). In 2000 he released a double-disc live album Ektos Topou kai Xronou (Greek: Εκτός τόπου και χρόνου, Out of Space and Time). In 2003, he released Oi Peripeties enos Proskiniti (Greek: Οι περιπέτειες ενός προσκυνητή, The Adventures of a Pilgrim). It was a popular and critical hit. In April 2006, he released an album of Cypriot folk songs titled Pou Disin Os Anatolin (Greek:΄Πού Δύσην Ώς Άνατολήν, From West to East) with his long time violinist Miltiadis Papastamou. On 9 March 2009, he released the album Neroponti (Greek: Νεροποντή, Downpour). Released in March 2012, Local Stranger is his 12th solo album and examines the “political and economic whirlwind” that has hit Greece in recent months.